Solent Stevedores has been operating the Bulks Terminal in the Port of Southampton for almost 20 years and handles around 1.2mt (million tonnes) of cargo annually of recycled metal, woodchip, gypsum, salt, animal feed, fertilizer, rock armour, refuse derived fuel and project cargoes. The award-winning stevedoring company has other bulk cargo operations in Immingham and at Silvertown, London for Tate & Lyle Sugars. Alongside the Bulks Terminal in Southampton, the company also operates an intermodal rail terminal, together with a fruit terminal and will also handle 86% of the cruise vessel stevedoring this year. In addition to these operations, the business also has operations in Jersey and at London Gateway. On behalf of its client Ultimate Fertilizers, Solent Stevedores handles 80,000 tonnes of fertilizer annually in the Port of Southampton. The Bulks Terminal has a draught of 11.2m and coaster-type vessels deliver the fertilizer to Berths 107 or 108. Typical tonnages vary between 1,500 tonnes to 7,500 tonnes per vessel. Given that Solent Stevedores can be handling numerous bulk cargoes at any one time, it has access to three Gottwald mobile harbour diesel cranes and the electric Titan crane. A team of ten staff is utilized during the fertilizer-discharge operation and their roles encompass crane driving, Bobcat driving, tractor & trailer drivers, a weighbridge operator, vehicle marshal and a person-in-charge. Depending on which crane is allocated for discharging a fertilizer vessel on any given day, a clamshell grab is used and these vary in size from 12m3 to 16m3. 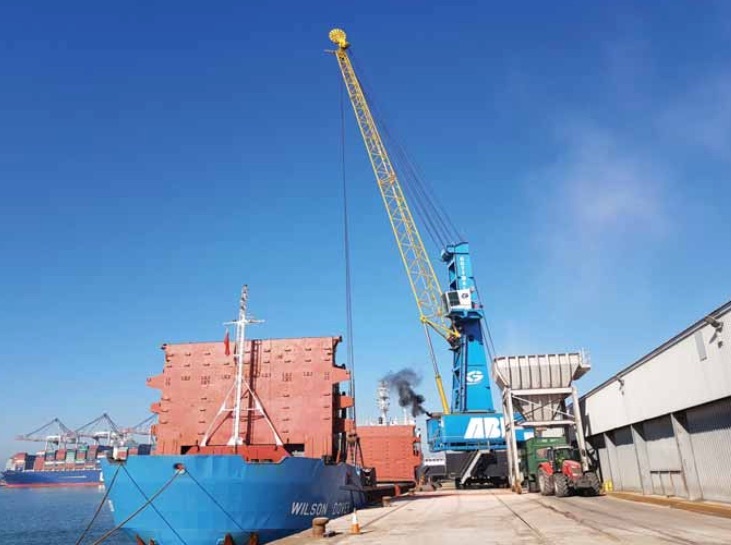 The fertilizer is discharged directly to a free-flowing quayside hopper where the product is then loaded into trailers which are then shunted by tractor, a short distance to the weighbridge for weighing before then travelling to the fertilizer terminal. Up to around 350 tonnes of fertilizer is discharged per hour, per crane, and through the vessel this equates to around 250tph (tonnes per hour), per crane. review their cargo volumes using their personal log in details. The fertilizer store is 4,860m2 in capacity and can hold up to 24,000 tonnes of any single product. However, in normal circumstances the store is sectioned off into six or seven separate bays with Stelcon walling to enable a variety of different fertilizer products to be stored. Once the fertilizer is discharged to store by the tractors and trailer operation, a front-end Volvo 120 loading shovel fitted with a pusher, is used to push up the cargo into its dedicated bay to maximize storage capacity. Once a sale is made, the most commonly used types of fertilizer are loaded into one of six 14-tonne silos via an elevator system from the intake hopper, and from here the fertilizer is transported to the blending unit. The next part of the process involves the calculation of the preferred recipe to the final specification required by the client and this can result in multiple types of fertilizer being blended simultaneously. If the recipe required by the client needs an oil-based coating, then the various fertilizer types travel through the blending tower and become coated. Those recipes which do not require an oil-based coating, go directly to the bagging plant. When the blending of a required specification is undertaken batches of normally around six to nine tonnes of the required recipe are manufactured. 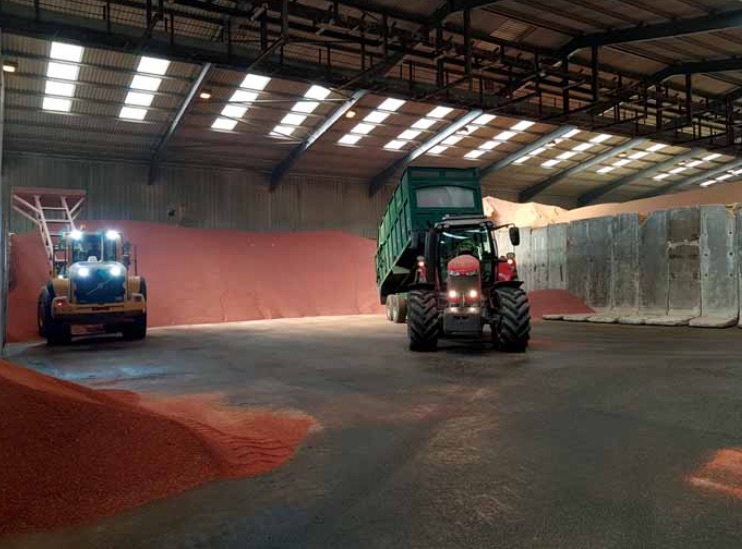 Once the recipe is completed, the blend is moved to the separate bagging store where a forklift truck, with an enclosed cabin, can then move the sealed bags to the yard awaiting collection, which can take place on the same day. 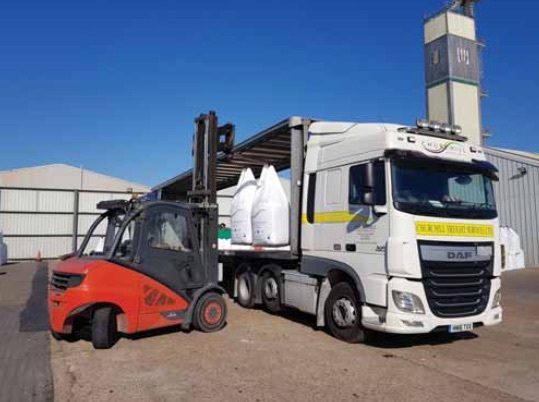 Churchill Freight Services, a sister company to Ultimate Fertilizers, is contracted to arrange a collection service for onward delivery to landowners and farmers. The fleet of lorries used can hold up to 46 × 600kg bags and 28 ×1,000kg bags, depending on the bulk density of the fertilizer. The various fertilizer types can vary in density from 0.7–1.1kg per metre. The challenges to the operation revolve around accessibility to the store on days when a vessel is being discharged and when the fertilizer is being loaded to conveyor, due to the configuration of the site. Other challenges include cross- contamination of cargo types, water ingress and stock control. Embracing new technology to drive further efficiencies throughout the operation remains an important consideration to ensure the operation remains competitive. The reliability of suppliers and continuity of a strong supply chain together with retaining full control of all aspects of the site operation, are essential to the ongoing success of the fertilizer terminal.